Today I am continuing the EVA foam introduction that I started last week, you can find part 1 here (in case you didn’t read it). This week I’ll be going into a few more details and a quick guide on how to do them. This messy subtitle is down to how to a mixture of how you want to put your edges together as well as the overall final look you are trying to recreate. For example for something like Halo armour, it’s got lots of very sharp, angular edges, so you’re going to have more separate pieces. For something like a female breastplate from WoW it’s going to be a large piece that’s heated up gradually and then curved around yourself or a dress form. Don’t keep the heat gun in the same place for long otherwise it will burn the foam. 1) (after making a pattern using curved object e.g. your acrylic sphere) make a cup out of separate parts (see seams) and glue together. 3) heat up a large circular piece of EVA foam until floppy, stretch it over the top of the acrylic dome first, then push it gently inside the dome without any folds or bends (if it does you either have too much excess foam or have not stretched it enough) and leave it until completely cold. The bigger the curved object the more likely you are to have to create it out of separate pieces. To get an accurate shape for your head either get someone to help you create the pattern on your own head (unless you’re lucky enough to have a lifecast of your head!) or use a mannequin head and make some adjustments to fit your own head. Around each main curved point you will need a separate piece. 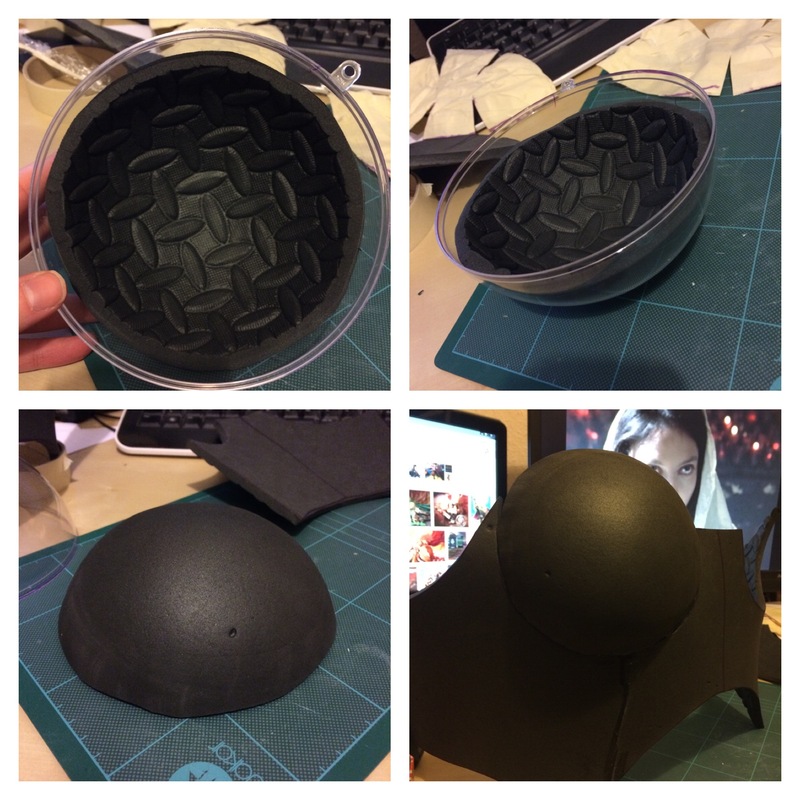 Check out this picture collage on how to make a helmet by HoneyBoba Cosplay. Plan very carefully what kind of edge you need for your seam before you glue it together. Do you need a straight edge or an angled edge? 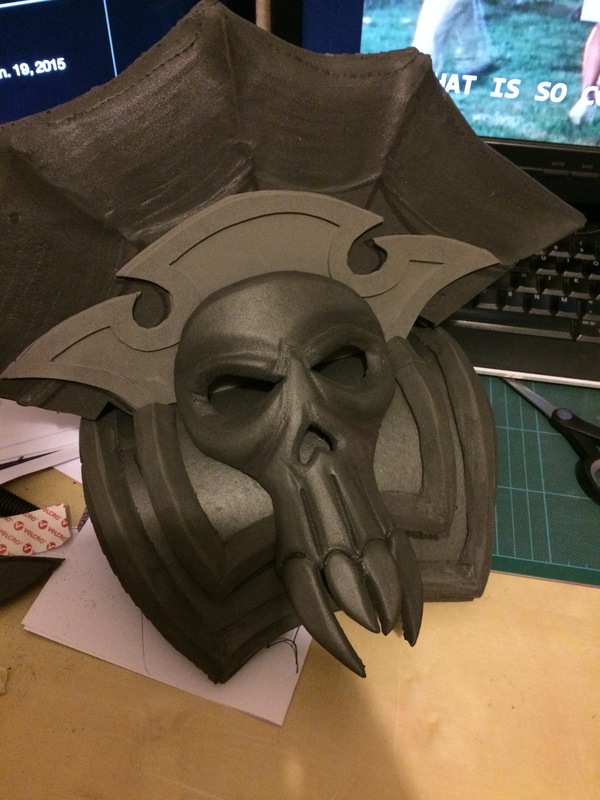 For my Wrath Sonya armour I needed to create 5 foam skulls. I’d like to film a tutorial for this when I can, but for now I’ll talk you through it. First create your skull template on paper then transfer it to the foam. I’d recommend drawing it on the back of the foam and cutting around the outside edge at an inward 45 degree angle. Flip it back over to the correct side and draw the eyes, nose and jaw. If you’re adding teeth, draw, cut and dremel them separately before sticking them on. Now here, you can either cut the eye and nose sockets with a knife, or use my preferred method of using a hot knife which is a lot easier for the smaller parts to cut out. After that, draw on the where the grooves to show depth to the skull (e.g. on the forehead, around the nose sockets, jaw, around the eyes) are going to go then get out your dremel with a worn down sanding bit and carefully start sanding all down the edges, including the eye and nose sockets, as well as the grooves under the eyes, forehead and jaw. Finally smooth it all down with some fine grit sandpaper. I’ve filmed a tutorial for how to create bevelled edges using a dremel. You can also do this with crafty angled cutting but sometimes it needs finishing off with a dremel. There are two ways to do this, you can either glue two separate pieces together, but then you’ll have a seam, or as a chose to do for a couple of pieces of the armour, is to draw your selected armour piece as a whole, draw on the underside with a ruler where you want the fold to go, then using your metal ruler and craft knife, cut out a strip of the foam on either side at a 45 degree angle of the fold line you have drawn. Finally put glue all the way down that gap, fold and hold it together until dry. Cuts and smaller details can be added with a soldering iron, hot knife, sharp dremel bit or a craft knife and then go over with markings with a heatgun to open the markings up. First heat seal everything by going over all the foam with your heatgun, keep it moving quickly as you don’t want to burn the foam. Priming is incredibly important, especially if you have been using a dremel as you don’t want rough edges to show. For any surface that was dremeled, I did around 5/6 layers of the PVA glue and water mix. I did this until the surface was completely smooth. 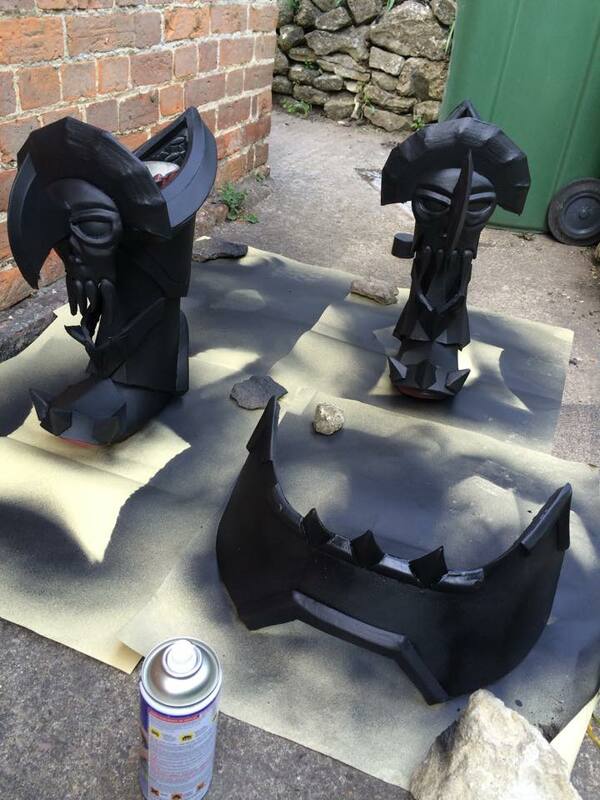 After all surfaces were covered with glue, I then coated each piece of armour with around 3/4 layers of PlastiDip. I followed this recommendation from another cosplayer and I really did like the smooth surface it gave, as well as hiding quite a lot of seams and making the armour look more uniform as opposed to separate parts pieced together. Hopefully you will have planned where you attachments are going to go before making your armour, if not, whoops. Not the end of the world though! There are many different ways you can attach your armour, I chose to use a mixture of Neodymium magnets and velcro. I followed a tutorial by HoneyBoba Cosplay on how to attach your armour using magnets. If you want to use strapping and clips I’d recommend taking a look at this tutorial. Thanks for reading! I hope it was helpful. Disclaimer: Please ensure you are of legal age to purchase craft knives in your country. If you are not confident in changing the blades yourself please ask for supervision or for someone experienced to show you how to do this safely. When heating foam always work in a well ventilated area. EVA foam fumes are not nice. Look after yourself lovely people!